Ninjutsu is the skills of stealth and secrecy that was practiced by the ninjas. 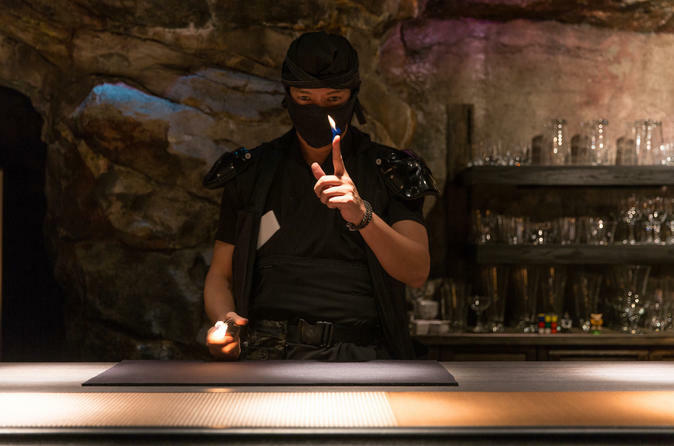 Unfortunately, there is no real Ninjutsu such as disappearing by smokescreen, but these Ninja at this bar is capable to perform NINJUTSU using their magician skills. 80 % of staffs of this bar are highly skilled magician, and you will be amazed in this Ninja world in Shinjuku! This facility was constructed as a hideout place for highly trained Ninja in October 2017. Since it is for Ninjas, there are many various kinds of tricks in this facility. Enjoy the Ninja atmosphere and breathtaking NINJUTSU with hidden contraption tricks of the facility. Once you create a booking, your name will be listed on the list, and you need simply inform your name at the facility. Then, Ninja staff will serve you three meals and perform NINJUTSU just in front of you.